Much like this octopus, researchers have many ways to reach out to the public. 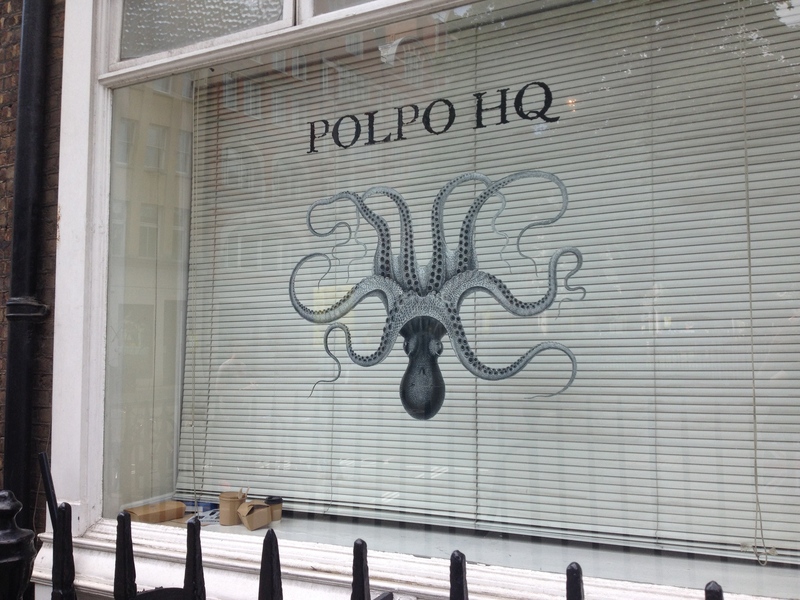 Our first Friday in London featured an all-day seminar on public outreach. This included speakers who discussed citizen science initiatives, new ways to use digital technology to help users engage with museum collections, and the various ways researchers are using social media to communicate with members of the public, as well as with each other. Some of the highlights of the seminar included Piotr Adamczyk’s presentation on the Google Cultural Institute’s initiatives to make museum collections and other cultural sites and artifacts digitally discoverable, Chris Lintott from Oxford University discussing the creation of Galaxy Zoo and many of the other subsequent Zooinverse citizen science projects, and Gracia Edwards from Elsevier highlighting STM Digest, the publisher’s initiative to present lay summaries of original research articles free of charge on Mendeley. The final session featured three presentations on social media use by academic researchers. Sierra Williams, editor of the LSE Impact of Social Sciences Blog, discussed the blog, as well as the reasons academics use–or, often, fail to use–social media for collaboration and for communication with the public. Ann Grand, of The Open University, presented on a similar theme, discussing her research on how researchers view public engagement, as well as how and why they use–or, again, fail to use–social media tools to engage with multiple publics. The final speaker was Charlie Rapple, co-founder of Kudos, a new tool to help researchers share their work, which includes functionality that gives researchers the ability to add lay explanations and enriched content to their work. I need to explore all of these resources more when I get home. We may know less that we should about what motivates people–which here means everyone from non-experts who want to contribute to a citizen science project to blogging scientists–to use digital tools to communicate research, and stay committed to using these tools, despite the time and effort. It is important to identify potential sources of “threshold fear,” or barriers that prevent newcomers from fully engaging in digital research spaces. Some lack of engagement may be due to the fact that people lack confidence. Many audiences, with members at various levels of engagement, are using the same digital tools. Said tools need to be designed to accommodate all of them. The same barriers are still being cited for researchers’ lack of engagement in social media space: time and lack of institutional support continue to be major factors. There is a recognized risk to scholars of not being online, but we don’t talk about it much. 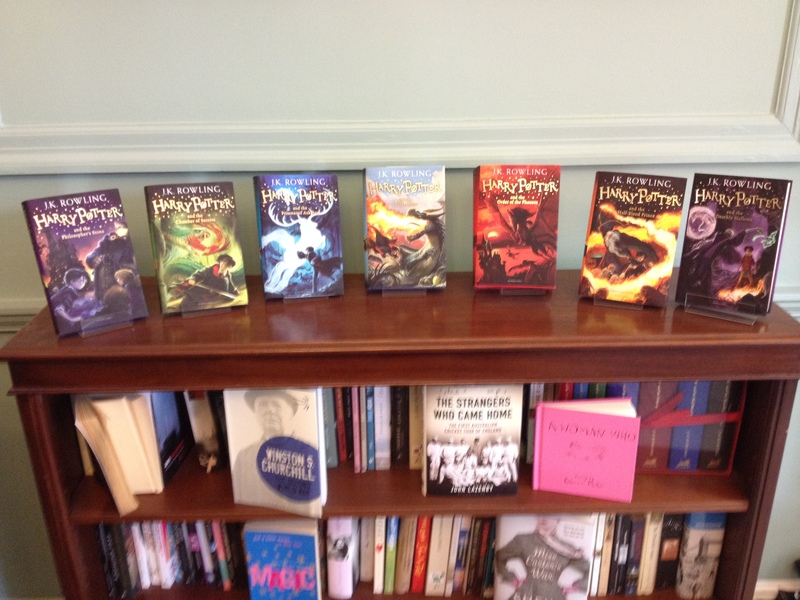 A display of Harry Potter and other books published by Bloomsbury. Today was devoted to exploring how digital technology is transforming the world of book publishing, and potentially the book itself. Much of what we see currently in eBooks is an electronic version of the print text, but Anthony Watkinson gave some examples of “Book 3.0,” or texts that are starting include features enabled by the web, such as embedded multimedia content. Online platforms may even change how strictly text-based monographs are written, as interest in discovering and accessing content by chapter may not only require providing rich metadata at the chapter level, but also authors and publishers to make sure each chapter of a scholarly book can be read as a standalone unit. After this, we headed to Bloomsbury Publishing, best known for publishing the Harry Potter series, to talk to some of their staff about their various digital initiatives, including Drama Online and the Writers’ and Artists’ Yearbook. This last intrigued me, as I’ve been reading a lot about the use of social media in academia as a potential substitute for (at least some part of) traditional publishing. This is not that. Rather, it’s an attempt to use social media, as well as online freemium content and in-person learning events and conferences, to build and energize a community around a still-traditionally published reference resource. This is much like the model behind how2become.com that we learned about earlier, with additional resources devoted to building an online community for users. Bloomsbury also uses a sort of gamification, a rewards points system to further encourage purchases and the creation of user-generated content. Users gain a certain number of points for various activities, for example, making a comment on a blog. Points can eventually be traded in for free books or discounts on services. I’m not sure whether any of this could translate into the world of scholarly publishing, particularly given several recent discussions about how academic motivations for creating content are so strongly tied to, and tend to be limited to, those activities that support career advancement, but there are ideas here worth pondering. The day ended early, so I spent the rest of it exploring more of the British Museum. I got through the Egyptian sculpture gallery, as well as a bit of Assyrian and Greek sculpture, before closing time. Alas, at this pace, I do not think I will make it through all I want to see before we leave. 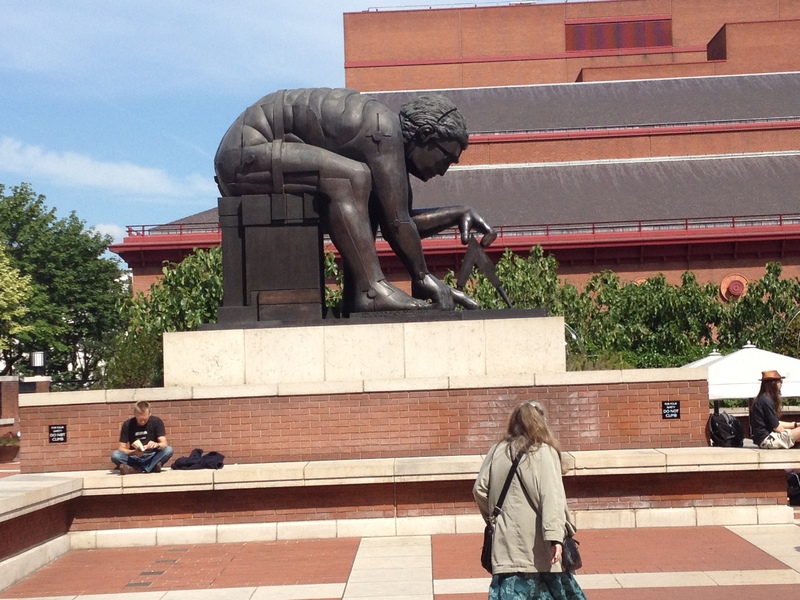 Today began with a tour of the British Library, the U.K.’s national library. According to its website and our BL hosts, the library holds a copy of every publication produced in the U.K. and Ireland, as well as a number of publications from other nations, with a total collection of over 150 million items, almost all of which are housed in closed stacks. We learned how to search the collection (which one should do before visiting, as the stacks are not browsable) and how to apply for a Reader Pass. The highlight of the trip was learning about the digital scholarship and preservation projects currently being undertaken by the library, particularly the British Library Labs. These represent changes digital technology is bringing about in not just in how humanities scholarship is done, but how it is accessed, and who does it, with crowdsourcing tools similar to those for citizen science. The presentation that interested me most was Jason Webber’s talk on web archiving in the U.K., and the contrast between two of its initiatives: the Open UK Web Archive, a collection that anybody with a web connection can search, but that includes only select web pages collected since 2004 for which the creators have given permission for public display, and the Legal Deposit UK Web Archive, which collects all freely available web pages from UK domains or hosted in the UK, but which is only accessible to users able to view the collection from deposit library reading rooms. Neither is a completely elegant solution to preserving and making available the often ephemeral content of the web, which is of course a significant issue for those concerned with the preservation of information; seeing the graph of just how much web content available in 2004 had disappeared by 2013 was a bit shocking. Our final presentation was from Christina Duffy on imaging the Magna Carta documents. Following this, we got to spend a brief time in the Magna Carta exhibit itself before heading to our next appointment. I fully intend to go back if I can. Things learned by accident: the name of the Pizza Express next to the library is deceptive. The food involves pizza, but isn’t be delivered at a speed that can be remotely described as express. The afternoon was spent at a forum on digital marketing. It was interesting to see the strategies publishers use digital technology and digital data to identify and market to various audience segments. I was most interested in a presentation from Kate Smith of Wiley, not because it represented the best digital marketing strategy–indeed, it was more of a cautionary tale–but because it involved a tool, the Wiley Online Bookstore for Libraries that helped address a genuine pain point for practicing librarians: the difficulty of placing small orders with scholarly publishers. I would have liked to have given this one a try while I was still a practitioner dealing with a collection. 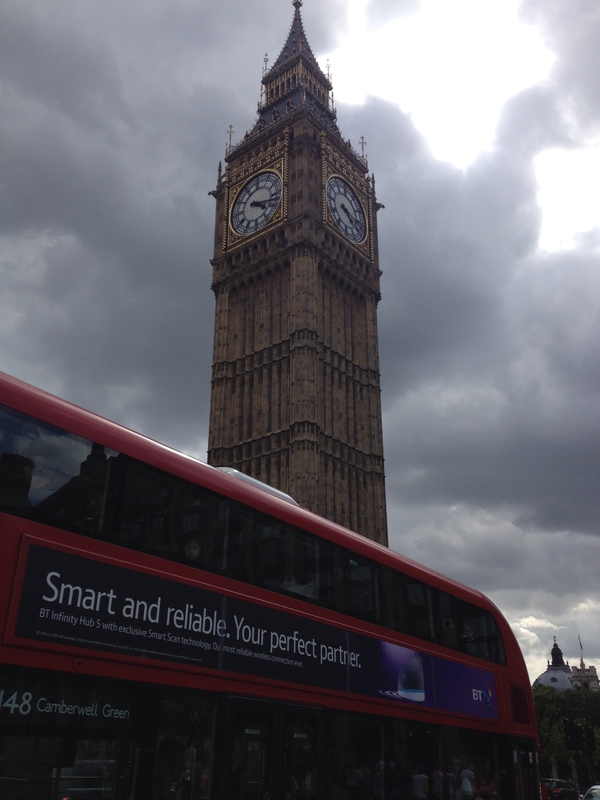 My third full day in London was actually the first full day of the course proper. We spent the morning talking about digital publishing and the afternoon learning about the research being done in the Department of Digital Humanities at King’s College London. This was followed by a reception in which we had the opportunity to mingle with a few of the researchers we had met earlier. First up was Anthony Watkinson, who discussed the history, present and possible future of digital scholarly publishing, including the pressure on publishers to meet increasing user expectations for digital products and functionality, the role of (green and gold) open access, the Force 11 Manifesto, and some of the research CIBER Research Ltd. has done on trust, in which it was found that scholars still tend to place trust in traditional peer-reviewed journals, and less in sources such as social media and repositories. He also discussed the fundamental needs of researchers, and how these differ when a researcher is in author mode versus reader mode, which explains much of the variation between the results librarians and information scientists get when we study researchers and those publishers get: we’re studying the same populations in different modes, where different sets of needs dominate. It is difficult to say at this point how the changing public and political attitudes towards open access Mabe discussed will ultimately change scholarly publishing or scholarly behavior. Certainly, the increasing number of mandates for sharing the results of research do force change in the behavior of many of the researchers to whom they apply. They also require technical solutions for the problems of storage and access. But will these replace or even fundamentally alter traditional scholarly publishing? As Mabe pointed out, institutional repositories and pre-print archives exist, but neither fill the function of the scholarly journal. Researchers who use these tools are still publishing their research in traditional ways. 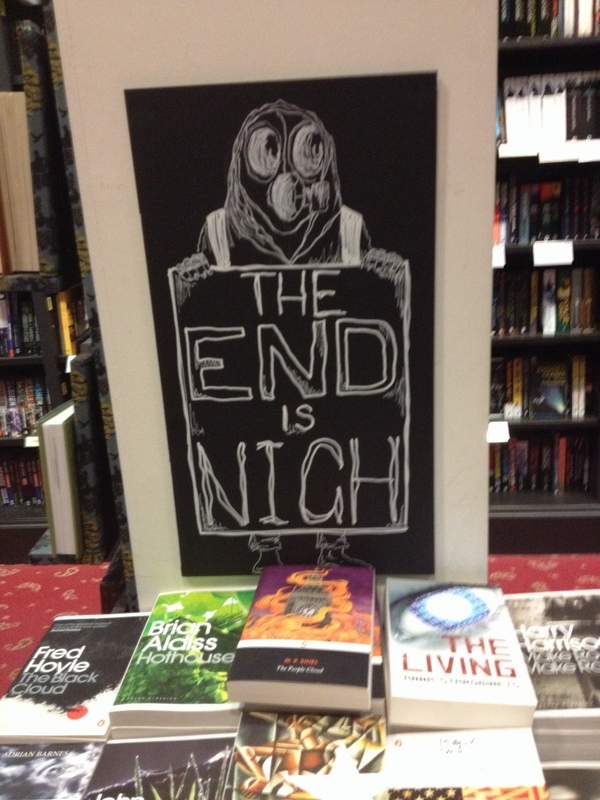 Is the end near for traditional scholarly publishing? From a researcher behavior standpoint, it would appear not, as most researchers who use tools such as repositories, preprint servers, and social media don’t seem to be using any of them as a substitute for traditional peer-reviewed publication. The business models for publication may be changing in some significant ways, however. I look forward to learning more about this in the coming weeks. The afternoon’s presentations in digital humanities at KCL Drury Lane highlighted some impacts of technology on research that I hadn’t previously considered. Department Head Sheila Anderson notes that researchers there are studying not just digital humanities, but “the digital human,” and how technologies are changing both human lives and the way we produce culture. As my focus for the past several years has been on STEM research and researchers, I’ve thought less about how new technologies are changing the kinds of research that can be done in the humanities, but we learned about some truly nifty things being developed and used, such as Faith Lawrence’s tool for annotating and analyzing fictional narratives, and the DigiPal tool for analyzing medieval handwriting. At the reception, I got to talk to many of these researchers about their dissertation work, and how communication and information sharing varies by discipline and by environment (academia vs. industry). Finally, a group of us departed for dinner at a nearby Indian restaurant, then home. Today was our introductory day for Scholarly E-Publishing. This was the day we got to meet with our instructors, as well as our student counterparts from Pratt and do the housekeeping part of the course. We got our identification, went over the course schedule, discussed assignments, and–perhaps most importantly–found out where we will be having class during most of the unit. 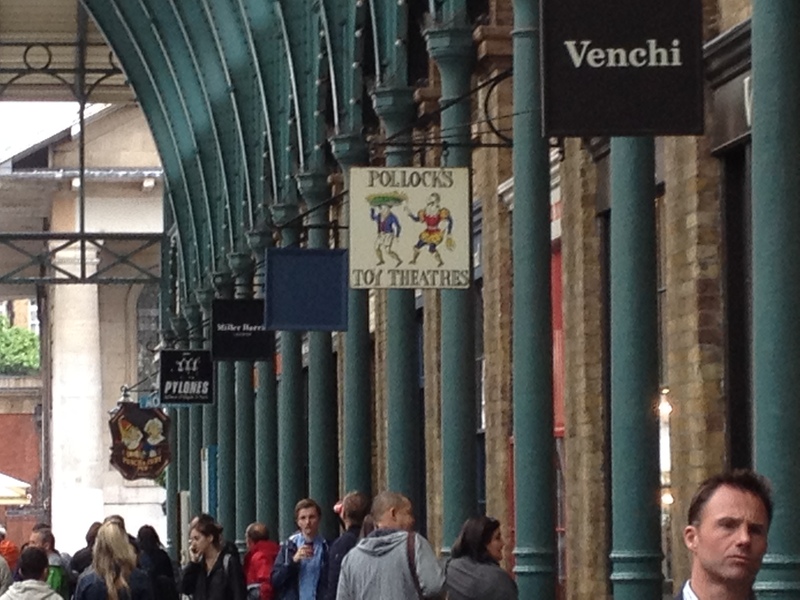 Lunch was at Covent Gardens, where I also found a few interesting shops I would like to visit later. I am very excited about the syllabus for this course. I’ve experienced scholarly publishing from the library perspective, but know comparatively very little about the publisher perspective, so I’m looking forward to being able to meet and interview people from that side, and get their perspectives on the future of digital publishing. 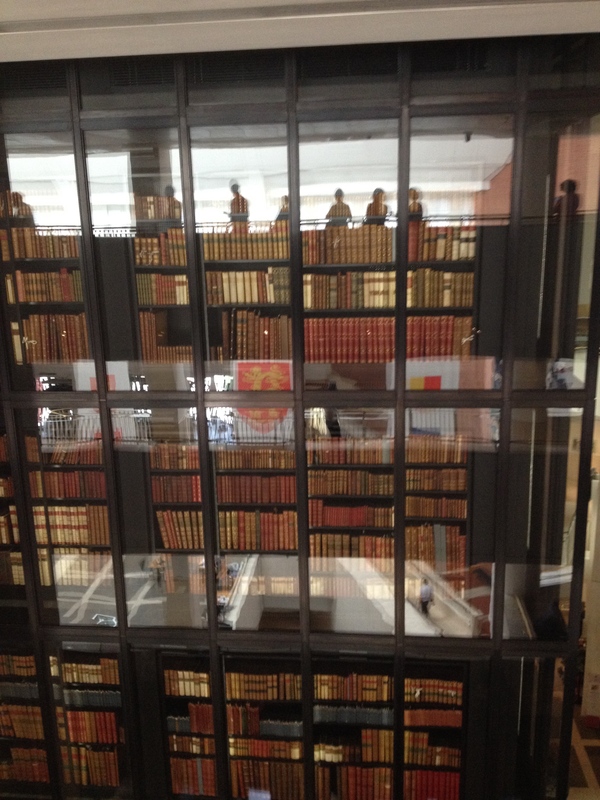 Also, our field trips include visits to the British Library, the National Art Library and the Bodleian Library. Overall, it looks like it’s going to be a busy two weeks. Inevitably, there probably will not be enough time to get to a small fraction of the things that were suggested for doing during our free time in London, though I’m hoping to be able to take in a show and spend some time in at least a few of the museums before departing. Our plan after class was to visit the British Museum. Fortunately, we made it before they closed. Unfortunately–after a detour which involved attempting to run a couple of errands on the way and getting temporarily disoriented–we made it with only ten minutes to spare. This was just enough time to get to see the Rosetta Stone, which was probably both the cultural and information-related highlight of the day. Other information-related observations: I did not realize how much I’ve gotten used to both readily available unlimited mobile data and my own personal search result filter bubble. The latter because now that Google knows I’m in the U.K., the search results I’m expecting to be at the top of the page in a number of searches…aren’t. In a much more obvious way than the changes that occur when I’m wandering around the Lower 48. It’s unsettling. Tomorrow is a long day ending in a reception, so I had probably better turn in. 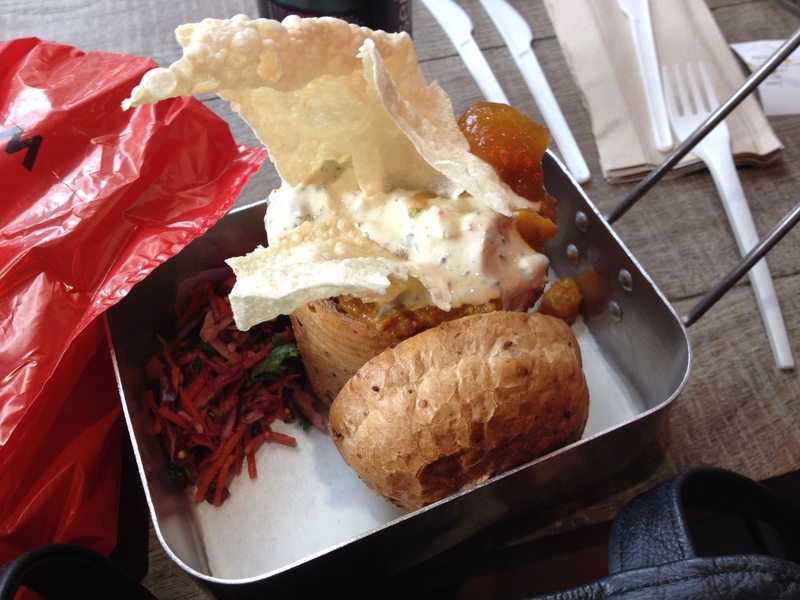 Today’s culinary highlight: Fish and chips. Day 1 in London. I’m journaling my adventures here at what I hope will become my regular blog. 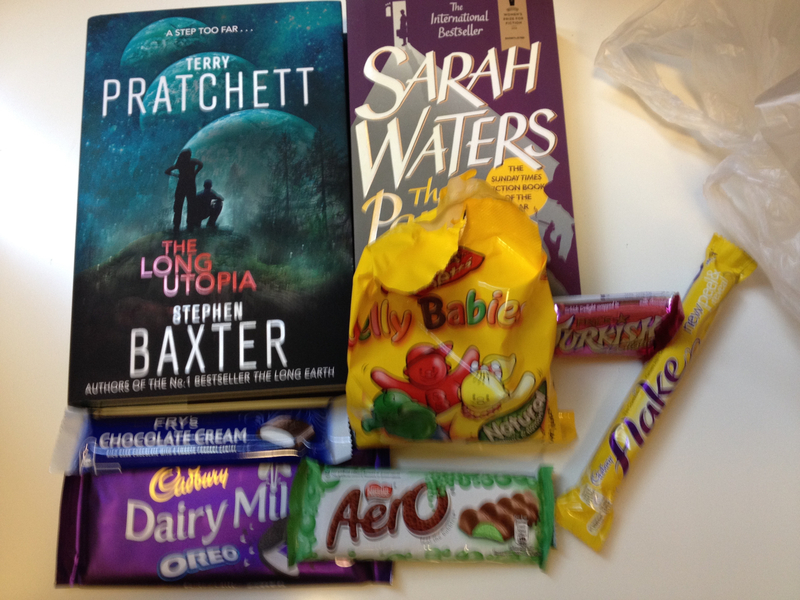 Have fulfilled two very important goals: 1) visit Foyle’s and purchase the new Terry Pratchett (and also a bonus Sarah Waters novel), and 2) acquire a bunch of British candy. Skills practiced: Taking the Tube, navigating the city without Google Maps. Tomorrow will be our first day of classes, and my first proper daily trip journal post.